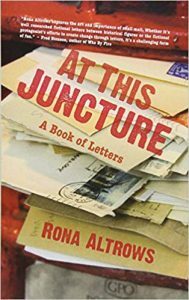 At This Juncture: A Book of Letters by Rona Altrows Now or Never Publishing 2018/$19.95/174 pp. When I was asked if I wanted to review your latest book, At This Juncture, I didn’t really know what the book was “about.” I didn’t need to know what it was about though—I’m always happy to review work by a fellow Calgarian, and I knew your short-story collections and Shy, the anthology you edited with former Alberta Views staffer Naomi Lewis. 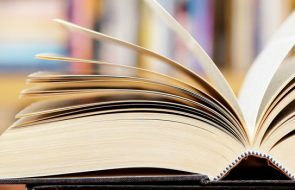 When Canada Post, which plays a key role in At This Juncture, delivered the book, I couldn’t have been more pleased to see that it was a collection of fictional letters. If I was teaching 18th-century literature, this would be the place for me to expound on the long and honourable history of the epistolary novel, and maybe remark on the opportunity for character and plot development that letters afford a writer, especially when compared to email or text messages. But I’m not teaching anything, and At This Juncture isn’t an epistolary novel. It’s a grab bag of fictional letters from historical figures major and minor—General Wolfe of Plains of Abraham fame, and Helena Jans, the mother of Rene Descartes’ daughter, for example—set amongst a series of epistles from the redoubtable Ariadne Jensen. Ariadne, who, as were both you and I, was raised to write letters by hand as a matter of course (how my Nan in England must have cherished my detailed account of the goings on at Eugene Coste Elementary! ), writes to everyone. She writes to her friends, her enemies, her heroines (Lady Gaga and Golda Meir), and to Canada Post, to whom she proposes a scheme of encouraging letter writing through rewarding the purchasers of postage stamps with her own fictional letters (those mentioned above). Rona, I was sad that Canada Post didn’t see the genius of Ariadne’s proposal, but I was very happy to meet her. It was a pleasure to meet a character who is, at turns, warm-hearted, a little cynical, old-fashioned in a good way (as I plunge ever further into my fifties I’m finding that I use “old fashioned” as a pejorative less and less), and fully tuned in to the modern world, even when she doesn’t entirely approve of its ways. The centrepiece of Ariadne’s emotional life is her relationship with her friend Leo, a gay man in his 20s, and it would have been delightful to read letters from him to her, as well as the other way around. But, of course, handwriting letters is not what the young do. I’d be pleased if they started, but while I wait, checking my mailbox in vain for correspondence, I can always dip into the letters in At This Juncture. —Alex Rettie is a long-time reviewer for Alberta Views.